Hello; as the title states today I want to share with you my favorite lipsticks for fall/winter. 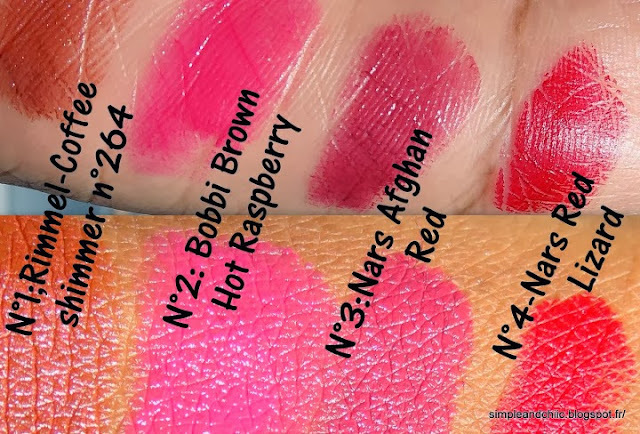 I really don’t think that we need any specific lipsticks for each season; but like everyone else I think I tend to reach out to some particular lipsticks much more often that others depending on thenseason. Below are some swatches so you can see how the color look on the palm and on the back of my hand. This is a bright pink lipstick. Bobbi Brown launched this line of "sheer lip color" last spring. They feel like balms only they are very pigmented which is a good thing for me. The below picture is not true to color. The color looks even brighter in real life. I love this lipstick for the winter for 2 reasons. Number one it feels like a balm; so it is perfect for my very dry lips. Number two the bright pink color will fit perfectly in contrast with the dark outfits (navy blue, black, grey…) that we all tend to wear more often in winter. This is a semi-matte lipstick, so the color last a long time and you need minimum touch up. Don't pay attention to the name because it is not red but more like a dark brownish pink. I think that the color fits perfectly with the colder days and gives me a natural and sophisticated look; all at once. For that reason I can wear it for any occasions. I just need to adapt the rest of my makeup depending on the event. For all those reasons this is my go to lipstick in fall/winter. This is the perfect red for the winter because it is a blue based red (or a cold red). It is a matte, very long lasting lipstick so it is a bit drying, but it is nothing compare to the famous Ruby Woo by Mac. Ruby Woo was originally the red lipstick I wanted to get but after a few trials in stores I quickly realized that it is way too drying for my lips. This one is a great alternative. the all look beautiful but my favourite look is the last one. Thanks ans this is also my favorite. For a long time I thought that red lipsticks would not work for me but this one has changed my mind. This is the first red lipstick I have ever bought !